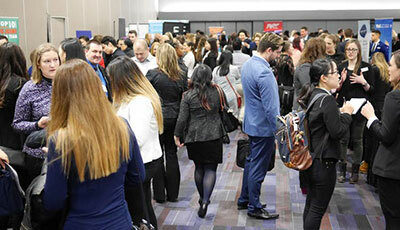 Now in its third year, go2HR’s annual Student Industry Rendezvous is the biggest, not-to-be-missed event that connects over 400 enthusiastic tourism and hospitality students to 35+ employers in the BC tourism and hospitality industry. Students can explore businesses and opportunities at each unique booth in the tradeshow portion, then chat with employers through “speed networking” roundtables about what it’s like to work for their respective companies. Employers are well-positioned to offer great insights about working in the industry and to meet and network with the future potential hires who already possess knowledge and skills of the industry through their education. 80% of employers who took the post-event survey last year said they would recommend the Student Industry Rendezvous to their colleagues and industry contacts. Spaces are limited and this event sells out every year, so don’t miss out on this great event that brings together students, educators, and employers in tourism and hospitality from all over BC for conversations that spark ideas, kick-start careers, and inspire businesses. Registration is now open. Register your company here. *Please note we are at capacity for students. If your school would like to be added to the waitlist, please contact Marie-Ève Masse directly.